As I sit to write this blog post, I am on a train from Dundee to Edinburgh. I am surrounded by luggage. Literally surrounded. My gigantic suitcase has both a longboard and a sleeping bag strapped to the side. Becca and Faith, legendary friends that they are, are sitting opposite me. And it is turning into a legendary journey of pretty epic proportions. Deep Impact finished at lunchtime today. It has been a truly wonderful, challenging and blessed weekend, and I am so excited to hear the stories of what God does in Scottish youth work this year. Because as inspired as I was by the main sessions, the worship and the speakers, I was just as moved by the conversations and the chats over coffee and the talks over cake and the prayer for those who are on the frontline. By the relationships. And as someone who is just about to leave Scottish youth work, to start the journey into (some very different) Japanese youth work, it was just a total privilege to be a part of the last few days. Holy Spirit has really spoken to me, I have laughed till I hurt, and talked late into the night until my voice has gone. Which is perfectly the best kind of combination. And although I might be physically leaving, I really do have such a heart to keep praying for Scotland! There's actually a common theme that's been coming through in both my time at Bible College, my personal devotional study and the main stage teaching this weekend. I'll try and explore this a bit more as I blog these next few days, but it's the reality that this amazing-cosmos-shaking-gift-of-salvation that Jesus brings about, that this world-shifting grace of God, that this transformation that creator-and-empowerer Holy Spirit brings… Is actually as big as all that and then some. Because somewhere down the line I think it's become really easy to think about knowing God and being forgiven as something that is just personal. That is just about us. About me. I make it just about me. And of course, that's the starting point. It's central to be forgiven for my sin and reconciled to God. To acknowledge my personal need. He has done everything to be close to us. But salvation isn't just to keep there inside of us. Salvation is also an invitation into this resurrection plan of an Almighty Creator and Redeemer who's plan is so much bigger than that. So much more. So much more than just me and God. It's about others, and it's about communities, and it's about justice, and it's about the world, and it's about the cosmos. It's about having a hope in the reality that Jesus is returning that doesn't leave us passive to His purposes, but that changes everything NOW. That changes us. That we are wrecked by the kindness of God in orde to partner with Holy Spirit in bringing change and being change and loving Him and others more. It's such a glorious truth. And He is such a glorious King. 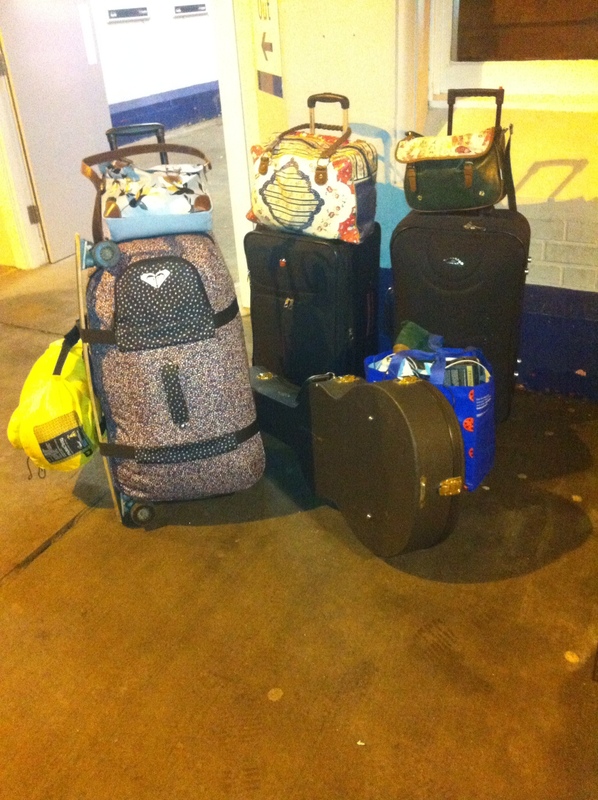 You know, my luggage, is all it's massive splendour, is spread over a substantial part of this train carriage. I thought it could just be contained to me carrying it. I was wrong. I had to give some to Becca, some more to Faith. I had to tie other objects on so that it became more and more visible. It just seems to be this story of ever-expanding luggage (which I really hope will stop soon… ;)) But I wish I found it as easy to bring the Shalom peace of God into situations. To overflow with Holy Spirit in a way that filled a substantial part of this train carriage. Because we are invited into a bigger plan that isn't just about us. It's bigger than that. It's more beautiful. It's more exciting.